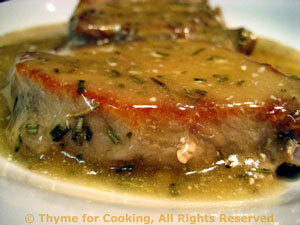 Braised Pork Chops, from Thyme for Cooking's Weekly Menu Planner. Tender, braised pork chops with fried potatoes and carrots: a simple, 2 skillet dinner. Browned quickly, then braised for a bit in white wine and rosemary, these come together quickly but are wonderfully tender. If your chops are quite thick you may want to increase cooking time by 5 - 8 minutes. In nonstick skillet large enough to hold the chops heat 1 tbs oil over medium-high heat. Add chops and sauté about 3 minutes per side, until lightly browned. To finish: Uncover and increase heat. Dissolve cornstarch in water in small bowl or measuring cup. Remove pork chops to small platter or plate and cover with the lid. Add cornstarch mixture to skillet and cook, stirring constantly until thickened. Remove from heat, stir in yogurt. Pour over chops and serve. Add as much pepper as you like, but remember it's hot... Best to add, taste, add more if you like or hot sauce. Slice the potatoes - the long way, first in half, then in half again. Now slice (the short way) about 1/4 inch thick. We are aiming for bite size so if you have a huge potato, adjust accordingly. Slice the carrots the same, if they are large, cut in half the long way first. Roughly chop the onion and celery. Heat oil in a large skillet. Add chili powder, cumin and sauté briefly. 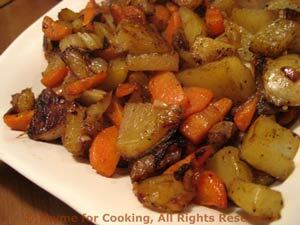 Add potatoes, carrots, onions, celery, and stir-fry over medium high heat until starting to brown, about 10 minutes. Add garlic, Worcestershire sauce and reduce heat to medium. Continue cooking, stirring and flipping as needed, until vegetables are tender, about 10 minutes longer. Add pepper to taste and serve.